A family dog is the main suspect behind the death of Ramisya Bazighah, 8, who was found lying in her house's front yard in Lowokwaru in Malang, East Java with a severe wound to her neck on Sunday. Malang Police chief Adj. Sr. Comr. Hariudin Hasibuan said no suspect had been named as investigators were still waiting for statements from a veterinarian. Local neighborhood unit (RT) head Titin Utamingsih said Ramisya had been being looked after by her grandmother. “When her grandmother was praying, she heard the girl screaming from the front yard where the dog’s cage was located,” Titin said. 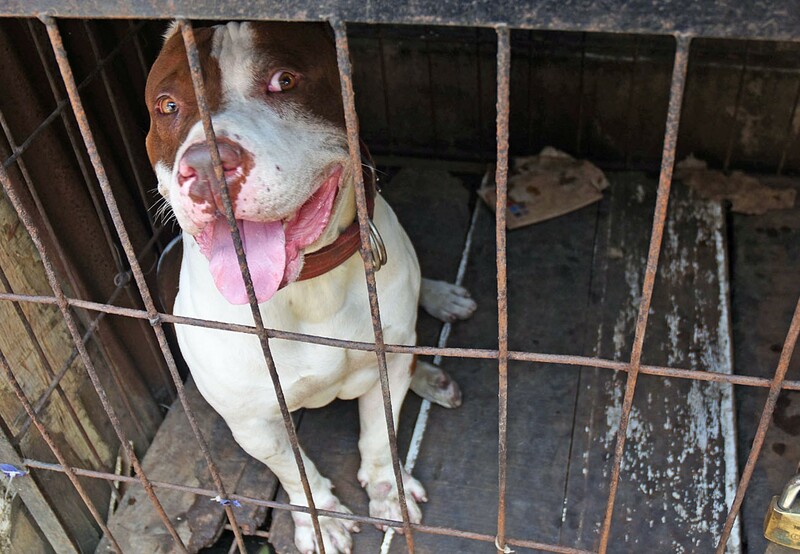 The cage was open but the white-colored pit bull was chained, she said. The grandmother rushed over and discovered the girl had been attacked by the dog. She screamed for help and neighbors came, Titin explained. Adj. First Insp. Imam Muhson Ridho, the head Malang Police’s K-9 police dog unit, said the eight-year-old dog was evacuated and later sent to a pit bull lovers community who would temporarily take care of the animal. “When I found the dog, it was in good condition and seemed to be well trained,” he said. The tragic death of an 8-year-old girl in the city of Malang, East Java, is being widely covered in the Indonesian media today due to the shocking nature of her death – she was reportedly killed by her foster family’s pit bull. According to the police, the pit bull attacked the girl – who was adopted by the family when she was two – on Sunday afternoon at the family’s home. At the time, her grandmother was at home but her parents were away. “The victim was alone because everybody else had gone to pray. There was no one around the victim at the time of the incident,” said Lowokwaru District Police Chief Bindriyo said yesterday as quoted by Detik. From their initial investigation, the police believe that the pit bull was out of its cage, though still chained and asleep, right before the attack. They say it’s likely that the girl dropped her doll near the dog, which startled it and caused it to attack the girl when she got near. “There is a wound on (the victim’s) neck, because of a dog bite,” Bindriyo said. The 4-year-old pit bull was taken into custody by the police. According to the family’s neighbors, the girl’s family adopted the pit bull from a dog pound to protect their house from theft, as they have been burglarized before. The police are also carrying out an autopsy on the victim as part of the investigation. Oh geez... Killer dog sent to a pitbull loving community. They've even infested Java.